It was on the 5th December last year when the late fashion designer, Karl Lagerfeld, brought his Chanel Pre-Fall 2019 runway to The Metropolitan Museum of Art in New York City. There, he met Tyler Brûlé, editor-in-chief of the London-based magazine Monocle, for a conversation. The audio recording was later made into a podcast. Karl Lagerfeld: I hate the expression, “You have to deliver for.” I’m delighted to do. TB: [Laughs] Indeed you don’t have to — you don’t have to do anything! TB: But nevertheless, when you talk about creating your own world — are you creating, also, a world for a specific woman or man, as well, season after season? KL: Yes, but you say that on the border of marketing. I don’t do marketing. TB: No, I know. I didn’t say the M-word. I’m not going to use it, I promise. KL: I have nothing against it, but no. My job is to propose a fantasy — whoever wants it, whoever likes it, whatever will be use of it. But I’m not there saying to myself, “This is for this kind of woman, this is for this kind of man.” No, it’s for all kinds, it depends on who likes it. 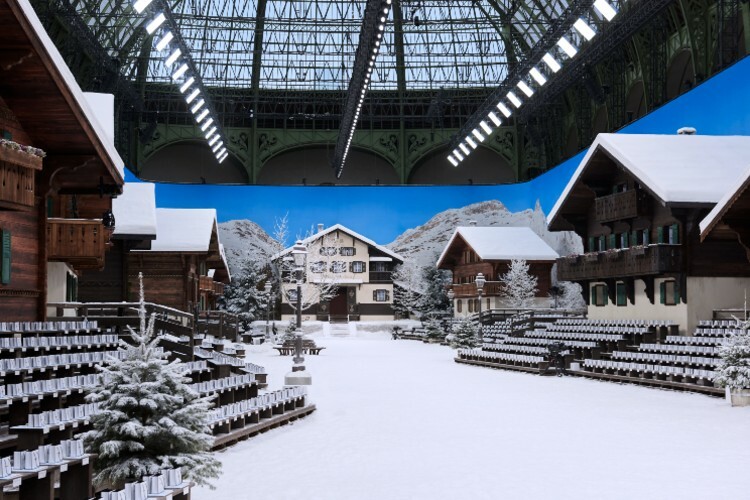 Chanel’s Fall/Winter 2019 collection showed weeks after Lagerfeld’s passing. It was reportedly one of the designer’s last collections that he worked on. Image courtesy of Chanel. TB: Well, it will be shown this evening. Can we discuss the process and the passion — to actually go and celebrate these men and women who are artisans? KL: Yes, but you know, it’s a collection with an inspiration from an old, disappeared culture, but it’s got nothing to do with this. It’s not like an old Hollywood movie about Egypt. It’s completely different. It’s best of today in terms of craftsmanship with inspiration from an indelible modernity from over 4,000 years ago. Because, look at those things, they are very modern, yeah. They are, not at all, bad taste and things like these. I think all Egyptians aren’t what we see, and what survived is flawless in terms of style, and taste. Bad taste came later. Models pictured backstage at Chanel’s Métiers d’Art show 2018/19 Paris-New York show. Lagerfeld and his right-hand woman, Virginie Viard, took inspiration from the Egyptians. Image courtesy of Chanel. TB: [Laughs] Can you put a marker on when bad taste arrived? KL: I think with the industrial era. Before, in the ancient centuries, there was no bad taste. They had modest things and beautiful things. But in-between, like today, and what existed say in the ’40s, ’50s, didn’t exist. TB: Is this one of the reasons why we need to celebrate the Métiers d’art? Because if we’re thinking that: Okay, the arrival of the industrial revolution might have also brought about a world of bad taste, that we need to remind people…? KL: Yes, but I mean, I don’t want to be pretentious and be like a priest saying, “Bad taste” and “Good taste” and things like that. I’m not a judge, you know — no. For me, it’s a pleasant thing to do. I can do in perfect conditions. We can travel the world, look how they are organised at Chanel and things like that. I mean, this is quite unique. That is enough as an explanation. If I need an explanation, it’s for tests— never explain anything because it will be worst. KL: Never compare, never compete! TB: Nope. But hopefully, millions of people are listening to this. What is unique if you, yeah, compare to others. What does Chanel do that is different? KL: The difference of Chanel is the past of Chanel and the present of me. TB: I think it’s interesting that we are having this conversation in New York. And certainly, given the show that is going to happen this evening — a time when America has become so digital, we’ve seen the evaporation of stores from the streets, the collapse of craft, people doing things with hands, do you think that we had to come back to this moment to celebrate artisanship? KL: Yeah, but I mean in France we still do. Even in the event of politics are not great in France at the moment, we are lucky that we still can do things in a way that they are supposed to be done, because luxury has to be luxury, it needs beautifully-made products — not just something whatever can go. I must say, Chanel is especially lucky because they own all those companies. If Chanel had not bought those companies, they would have disappeared too because the third, and second or whatever generation was not interested, had no talent, but we really had to save them because we need them. TB: You think this is forgotten because people look at France as, yes, a place that makes ships and cars and many things, but I think people also sort of look at France — complicated unions etc. What have been the forces, Karl, that you think have allowed France to still maintain this tradition of artisanship, of craftsmanship of this Métier, do you think? KL: Because they have not much else to offer. That was their strength, and you better stay on what you are good on than to go in a direction where others may be better. It’s a tradition and they tried, and I say Chanel helped to save traditions. TB: Do you think some other companies or other countries that’s looked to Italy have forgotten this potentially? KL: No, look. A company like Fendi they still do very well with craftsmanship — nobody else can do. 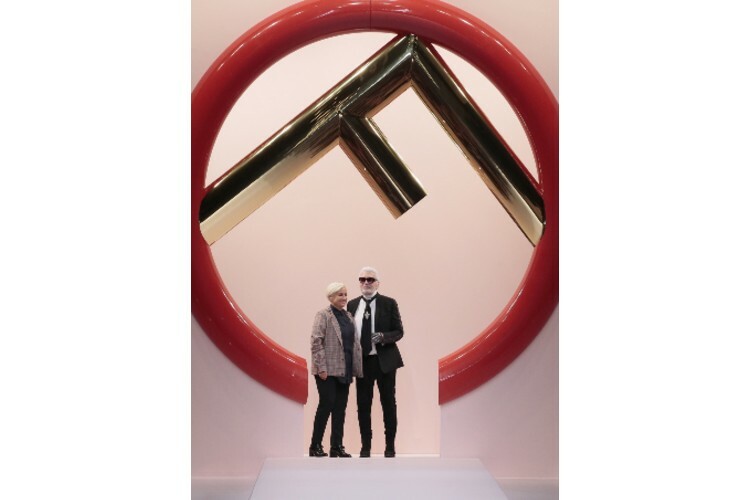 Silvia Venturini Fendi and Karl Lagerfeld posing for a finale bow at the Fendi Spring/ Summer 2019 runway in Milan. Image courtesy of Fendi. TB: But when we look at what’s happened today and maybe it will be interesting to maybe rewind to when you started moving into ateliers, when you started to work with artisans since the beginning. Is it a more difficult time — because Chanel has obviously invested in these companies, so you have these people at your doorstep. Or is it complicated to go and find the hand that you need today? TB: Let’s pretend we are not Karl Lagerfeld for a second. I am a young, designer starting out. Do you think it will — you have these tools that you might have had in the 1970s at your fingertips or not in the same way. KL: Yeah, but you know in the ’70s I was a freelancer designer for Chloé and things like this — I am still freelance but I was running two very — in terms of creativity because I am not running a business, I hate business, I am not a businessman because there are people who are very good on that and I may be a little better on designing. So Chanel was this very established — and Fendi, with every matter of terms, was established too. Lagerfeld is still another story but it is doing pretty well, too, now. So the whole thing, together, is very stimulating for me because I hate the idea of only doing one thing. One thing inspires another. If I would be isolated and cut off, I will retire at Chanel, I don’t think it will work. TB: That may be. But I think people are fascinated to see that you’re a photographer, obviously designing multiple collections, doing one-offs here and there. Has anyone sort of mapped the mind of Karl Lagerfeld to say how you can do all of these multiple streams? KL: Himself. I do everything myself. KL: You know, I know you can compartmentalise if you don’t think about it. Uh? I just go ahead. Problem by problem, step by step. Collection by collection. It is a non-stop business. But I’m enchanted and I must say I never liked it as much as I do today. It’s about conditions were never as good. So, if there is one person who cannot complain about what’s going on in the world or his work or in his business, it’s me. TB: Which is a luxury in itself today. KL: Yeah, but we are in the luxury business, darling. TB: [Laughs] We are indeed. Let’s go back to the tactile. I’m interested in sort of the notions of making things with one’s hand. In Britain right now, they say there is a problem with surgeons. Young surgeons now — because people are not using their hands the same way, you don’t want someone stitching you up, only doing this. KL: I’m not choosing it at all. I do everything by hand. And I know how to do it but I don’t want to do it. And I don’t do Instagram and nothing because I don’t want to be informed about what I’m doing. So companies may do it, but I personally live in a very retired way, because I need all my time, 100 percent, for what I’m doing. I cannot spend time from things I consider unnecessary as far as I’m concerned. KL: There is none. Not exactly — because what is interesting is what you imagine. It’s not always interesting with what you see. I totally agree with you. It’s the way I do things, as far as I am concerned, because I am not telling myself, “Oh, you want to be mysterious”, but I want to be not too well known in detail. TB: You are a keen observer of popular culture. How do we end up here, Karl? How do we get to this place where people need to feel that we have to broadcast what they are doing every second of the day — whether they are a brand or whether they are an individual? KL: This is a question I don’t know what to say because, for me, it is like a kind of mental sickness. From you to me — I don’t think it is normal. I will even say it is worst. Some of them are not that interesting. Who cares what they do? It’s odd to say that, but it’s true. I’m sorry. I prefer to be silent, so they cannot judge what I think, or what I say, or what I do because of the fact that they don’t know. KL: And also to note, I don’t have the time. The day is very short, I sleep very well, I have to take care of Choupette, my famous cat. All that — and I sketch everything myself. It takes a lot of time, you know. Because, in fact, I wanted to become an illustrator, a poster artist and a cartoon artist — I still am doing cartoons and drawings for the Frankfurter Allgemeine [Zeitung] once a month. Very hard and tough political cartoons, but I like the physical thing of sketching. 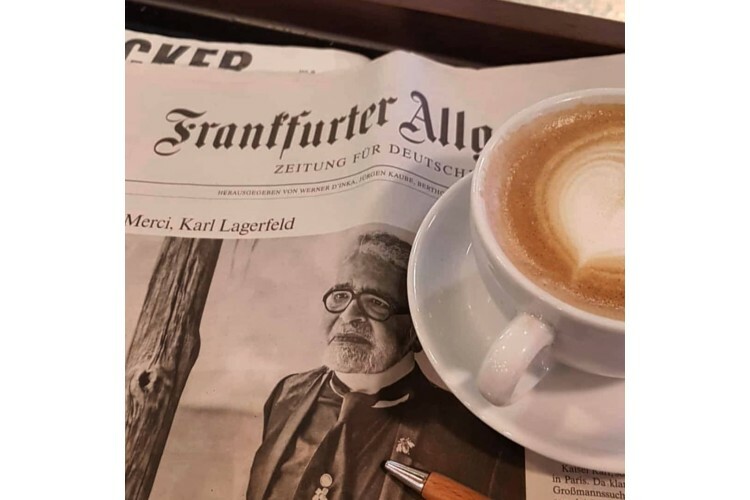 A tribute to Karl Lagerfeld on the broadsheet, Frankfurter Allegemeine, pictured on @in.ausschnitten‘s Instagram page. So, I look for ideas, and I don’t look at too many other things. Because I even said to my godchildren, “Don’t watch too many things on your iPads because you will kill your own imagination, because you see everything made, and sometimes in second-rate quality.” Imagination is something you need to cultivate and I, personally, close my eyes, when I can stay for hours, and make my own movies. TB: And this is, also, in itself a dying art. Because you have this sort of sense of over-stimulation, people think they have all of the — whether it’s history, whether they want to go and look at textile collections, and everything is really hard — how do I look at textile collections and not feel the collection? KL: Yes, exactly. Sure, that is the way. My mind is pretty well-organised. My memory is very, very good. I don’t need Google all the time. I remember everything, you know. And I have time for a lot of stuff in my head. 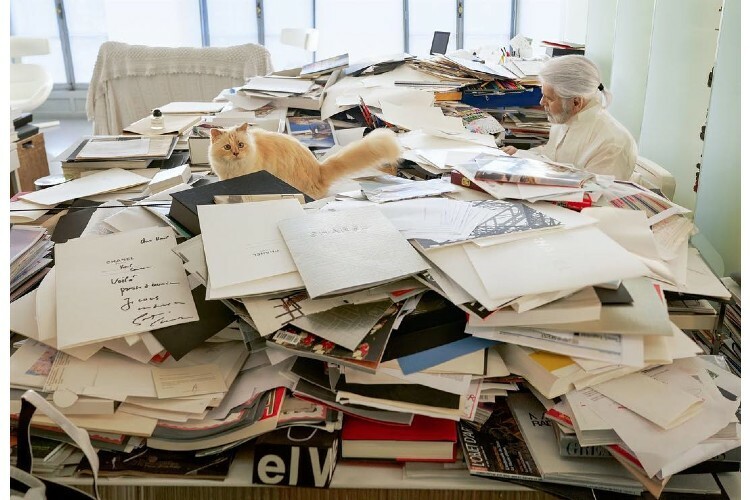 An image of Choupette lingering by a working Karl Lagerfeld, shot by Annie Leibovitz for Vogue’s September 2018 issue, on @choupettesdiary, a fan Instagram page for Lagerfeld’s dear cat. KL: Not a museum piece, I hope. TB: No, no, no, no. It’s always remarkable because adaptive knowledge, which is at your fingertips. And I think one of the great challenges of our time right now is people feel when they flip open an iPad… and they can’t recall anything. KL: Yeah, this is for the public. I’m not the public. That’s the difference. KL: I have to invent my own world. I live in my own world and I use what happens there in my work. Because I think we are — not I think — we are in a very difficult time, where this craftsmanship is dying. KL: That’s why I repeat myself every day: “How lucky I am that I don’t have this kind of problems.” Because I think it is a miracle. But Chanel did a lot — I mean, the company — that this miracle could and can help. KL: I was supposed to go to a party tomorrow, but it’s cancelled. KL: That’s still not enough. There’s still the passport. I’m European but not somebody local for any other countries. KL: I will say something old — nobody gave me advice when I started. I built my whole career the way of doing myself. So, I am not a teacher. Because I don’t believe too much in telling people what to do. Everybody has to find his own way in his time. So, I am from another period, but totally at ease in today. That’s a luxury they cannot afford because they were not wrong before. TB: But should we attempt to inspire them? TB: No, of course not. KL: No, no, no, no, no. No, you know I always think I can always do better. I’m never pleased with myself. When I’m finished with a collection and people say, “It’s okay.” I’d say “Yes” to myself, but doesn’t matter, there’s the next one, you think like this? I’m not at all somebody who is totally satisfied all the time. I’m never satisfied, and I think that is the secret of the success — if you can call my career a success. TB: Down to earth, for sure. But, is it down to Mr Pavlosky? Is it up to a minister in Brussel? Probably not. Probably more Mr Pavlosky — but to make sure that we have a collection of people who can still make things today. I mean, is it private sector? Public sector? KL: You know, at Chanel we are very lucky. And I’m not talking about me. I have Mr Pavlosky who is perfect for what he his doing. Virginie Viard who is running all the different studios — who is genius. Egleé to care of the image and Laurent who does the press. And the five of us, we live perfectly well together. We don’t bother each other with endless meetings. Maybe they have meetings, I don’t do meetings. I sit in my armchair in the studio and we have small talks. And out of those small talks, we make our collections. No marketing. They do marketing. They, maybe. But I don’t have to do it. I only have to deliver ideas in the collections. TB: And photos and the campaigns? KL: Yes, yes, yes, yes. Sure, sure. Yes. TB: What do we call that? KL: Yes, yes. That’s part of the game. Because I see it like a game, you know. I am very lucky that I have this strength around and behind me. TB: Has it always been a game? KL: No, no, not every year. My contract for Chanel said four, but I’m doing ten. Not because they ask me, but because I thought it was the right thing for the shops, and for the whole image that we can change all the time. So, it is the kind of involuntary marketing I’m doing. It’s only because I like Chanel to be around — and all the time. That every two months, the shops can be different and there is couture and all that. Nobody else has it exactly like this, because perhaps, they don’t have me. TB: But this, as you have said is ‘involuntary’ that you have gone to the sheer number of collections. Is this Karl walking around the streets looking at what other retailers are doing at different levels saying, “We need to do this”, or is it because —? KL: First of all, I don’t go on the streets because people are behind me with their selfies and all that. My look is too popular to be on display publicly. It’s all what I said but it is true. So, no, no, I am very informed, I read every newspaper, every magazine. It is difficult to find somebody less informed than me. TB: But, as you said, you are delivering all these collections now as a proposition within one of the most respected maisons in the world. KL: It became. When I took over, everybody said to me, “Don’t touch it. It’s dead.” But this was an interesting challenge and the owner said to me, “You can do what you want.” And I am doing what I want and apparently, it worked. TB: But, why did the up tempo of so many collections now? Is that to satisfy and create many more worlds to satisfy? KL: No, no, no. Not all all. You have to know in what time, and what kind of lifestyle you are living. We have to go ahead of times, not after what’s going on. We have to be ahead of times, that’s part of fashion. TB: For sure. And is there a different consumer that you — ? KL: I don’t think of consumers. TB: I knew that actually. I shouldn’t have said the ‘C’-word. KL: No, no, no. You know you are lost. Don’t flatter other people’s taste and think that they will like it. Do what you like and that’s enough. You can make a mistake, but you can do also something decent. TB: So, even if you have sketched the cartoon in the Frankfurter Allgemeine Zeitung. You have gone right at the front page about — yeah, the boom in the Chinese market. You don’t feel compelled to say, “I want to reach more women in Shenzhen”? KL: No, this is a line for a company, not for a designer. Personally, I’m not supposed to reach anything, except to make this collection. TB: So, that’s something for the people at BMW to worry about, and Mercedes and elsewhere? KL: Exactly, exactly. We are not selling cars. KL: I love to go there. KL: Yes, but I’m not encouraged as the way I say it to myself, “No, you are encouraged.” No, because I am interested in design. I buy furniture from designers from today, like Martin Szekely, like Marc Newson, like the Boroullec brothers, or like this German man who makes glass furniture and now marble furniture called — a name that is impossible to pronounce, — ‘G’, ‘R’, ‘C’, ‘I’, ‘C’. TB: Oh, Grcic? Konstanin Grcic. KL: Yeah, it’s impossible to pronounce. But I just bought a whole set of his last exhibition at [Galerie] Kreo, and made an entrance hall in Paris with that in one of my houses in grey marble, mixed with stuff from Marc Newson and Swedish carpets from 1930s. And it’s funny when I saw the furniture, I made a sketch for myself, order the things, and now they deliver it six weeks later and it looks exactly the way I wanted it to look. What I saw — my eyes closed — when I saw the stuff, I think it is very beautiful. I have it now exactly that way. Not that marble furniture is the most comfortable thing in the world, but it’s a hall, an entrance hall. Nobody sits down. TB: Was that deliberate that no one sits down and they keep moving? KL: No, because I like to be in a modern mood, you know. I had all kinds of periods. I went to the 18th century and now I like things from today because I think today is quite interesting. And there are very good designers, and there are not always so good designers. TB: So, does the young designers, if it’s Konstanin well, the next Konstanin Grcic making furniture, if it is someone who is coming up through one of your ateliers, because of access to information — yeah, obviously because of deep archives, do people have it easier? Think about when you started, Karl. KL: First of all, there were archives I hate and I never look at archives. And I go to galleries. I mean the best galleries, like Kreo, I go there. I’m in France so for me, it’s an easy thing. There’s no problem. If I see something I like, and I think it is new and different, I buy it. If I like and I can buy it. TB: So, what about the young designers today? Do they have it easier — with reference points to say, “I’m going to go create a piece of marble furniture. I’m going to go make a dress. I’m going to create a handbag collection…” — when you think back to the start of your career though? KL: Yeah, but I mean, they still have to find the right gallery to promote that and it is not that easy. I even think it is even very difficult. And those are not trendy either, if you know what I am talking about. KL: Konstanin Grcic or whatever his name is. And you know his real name is a German name but very easy to pronounce. You know him? TB: Yes, I have met him many times. KL: Good. Not a bad thing, better than short and fat. You know, I bought his entire collection of glass furniture he did two years ago. You saw them? I think they are beyond — the worst thing is that the chairs and glass are comfortable. Nobody would believe it. I have my whole studio in the south of France made with those glass furniture. I bought the whole collection. I am still mad for it, I think they are genius! TB: I want to talk about — this is maybe a bit of a rewind — but, I guess inspirations you said… what was the vision to be doing cartoons for one of the major zeitung in Germany when you were young and make this a career versus the trajectory that took you to where we are this evening or this afternoon. What was it that actually sort of led you into the world of atelier and fashion in particular? Was there a turning point? KL: No, an accident. I won a contest and it started all with that, you know. A contest when I was in school. I never went to fashion school or nothing, you know. I didn’t finish high school. Nothing. I am the most improvised person in the world. But if you know how to improvise yourself, it may work. TB: Yes, that’s very true actually. It would be interesting if actually more people recognise that. KL: You think so? You know, I believe in myself but I want to make the effort that this trust could be a reality. KL: I am a professor because I was once a teacher in Vienna for two years. I hate that. In Vienna, I never go there where it says to me “A Professor!” Grotesque. TB: But you have this extreme in Austria, in Switzerland, in Germany, of ‘The Doctor’. On the other side, you have ‘The Apprentice’ , people who learn how to do things with their hands and make things, whether it is a carpenter. You still have this in the German speaking world. KL: It’s on another level, you know. I’m the one who tells them what to do. KL: It is not the same thing. I personally know nothing. I am totally stupid to do things myself, but I now know exactly how they should be done. I don’t even know how to make a bed or cook an egg. TB: Yeah, you don’t have to have a degree to go and fix a telephone line. And people do need their phone lines fixed. And yet, everyone is being pushed. I was thinking, what’s interesting is there is a whole world of improvisation that we need to encourage. KL: Improvisation has to be professional too. There is some knowledge needed to improvise. You cannot improvise with an empty space. Every base is needed. TB: — someone needs to just go and buy a Bernina sewing machine and try things out. KL: I know a lot of people who never went to this kind of school and did great things, myself included. I’m not a PR for fashion schools. KL: No, no, no, no, no. It’s no longer my studio. For the rest, it’s up to every department boss to find the right people. I don’t tell. We don’t “take this”, “take this”. I don’t know nothing about. I don’t tell you answers, “What goes, and blah, blah, blah.” It’s up to them to find the right person. And if they don’t like those persons they come to the studio, they can fire them out of the studio. But it never happened. Not even once. TB: That’s quite a record. It’s amazing. TB: [Laughs] We touched on Europe briefly, but New York — the state of the United States, and I’m thinking more, in terms of fashion inspiration, what you see. Are you drawn to the concept of the USA as a consumer culture or pop culture? KL: I always was. I always thought America was great. I love America. I love every country who has a personality. So, this is a kind of question I cannot answer because, for me, it is beyond normal. TB: What countries don’t have personality? KL: But I’m not a marketplace person. TB: No, I know. But it’s still a place — okay, let’s just call it a country; wouldn’t call it a marketplace. But it is a land of consumers; it’s the world’s biggest economy. TB: I know you are not on the street. But nevertheless, when you are out and looking at the US landscape, is it something which challenges and inspires still? KL: I have to answer that question? KL: [Sighs] Maybe, but I really don’t know. The way it is, it’s not something that I say to myself, “This inspires me”. I don’t know. The simple fact that America exists the way it is can be an inspiration, but I am not somebody who is picking out things to be inspired. KL: I don’t make mood boards. TB: No, I didn’t think so. KL: The mood boards are in my head. TB: Does that frustrate your colleagues? KL: I don’t know but it’s the way I work. I hate mood boards. You are copying things, more or less of recent past. I don’t do that. Goethe said something very interesting, to “Make a better future by developing elements from the past”. It is one of my favourite lines. It’s good, no? And also, when you make a collection, you have to make decisions. And there is another example, Lady Mendl. You know who that was, a designer. She did the inside of the Frick collection, she showed her project to Mr Frick. He liked it and he said, “Do you have another idea?” And she said, “No second option.” And this is one of my favourite lines too because before you propose something, you have to ask yourself all the questions you like, you’re 100% behind it, and everything. Because if I said to you, “Look at… I mean, you like this?” and perhaps “No, no, no”. There is one thing and not two. No second option. For me, that was the genius of Lady Mendl to say. Back then, she was Elsie de Wolfe. No second option. It’s very good. KL: And [Baruch] Spinoza said, “Every decision is a [final] refusal.” It is one of my favourite lines too. I have a little stock list of lines like this I live with. KL: Yes. But, I don’t give them culture lessons, I don’t teach about Spinoza. KL: There is another German philosopher who is called [Immanuel Hermann] Fichte. He said something genius in 1860. He said, “With all that is going on in the world,” — look at today — “who can believe in god? But who did the good things?” There is no answer. I think that is genius. KL: Yeah, but also you know, there are so much more images, diffusion of possibilities on the net, on TV, on everything. The communication was not the same in the ‘60s. Maybe you are too young to remember. KL: That was another planet, my dear. TB: It was another planet. But here’s with every industry, we are so bombarded with so many images and yet, vehicles, aircraft, even furniture — everything starts to look very, very similar. You’d say almost sort of these five Instagram filters in the world. And everything sort of live around these five filters. KL: But you know if you were to have a second look, there is still quite a lot of good creativity. KL: You must have a second look. And not say that everything is okay and we need nothing else. There is a lot of good stuff around. KL: Yes, it’s also laziness, the kind of intellectual laziness. You know, they are there with a little thing. I don’t think they always make a big intellectual effort. If you don’t make an effort, you will lose. TB: Again, coming back to another challenge of our time. I want to go back to Frankfurt for a moment. In the Frankfurter Allgemeine Zeitung, I mean, a newspaper which barely had a picture on the front cover until a few years ago — a sea of black and white impenetrable, but one of the most respected newspaper in Europe. KL: And quite well-written. Do you read German newspapers? KL: I noticed recently many that French daily papers are not well-written. They are boring. That’s over. The American, and English, and German press write better. The writing is much better. It can be mean, but it is more fun to read. TB: Are we allowed to not talk about the state of Germany today, but an Germanic influence in process, as you said, made the way you compartmentalise things. The importance of deadlines, do you still see a certain rigour that came from life in Northern Germany which informs what you do? KL: But, the real drama of Germany is that the beginning of the century, the German culture was a mix of German and Jewish people. And today, it’s not anymore. Because, look at Germany from the tins and all that silent movies about Reinhardt and Mahler all that. There is nothing of that level, so I’m afraid that the Germans needed Jews more than they thought. And my mother always said, “Germany without Jews is like a dish with no salt.” That was what I was told as a child. TB: And what was her thinking because of that? TB: What did she see within a Germanic context that said, “This is not going to be for you.”? Was it from a creative point of view? KL: She saw that the Germany in the ‘50s was bored and she had lived in Berlin in the ‘20s, and saw that it doesn’t exist anymore. So, go to Paris and make it there. And I could speak French and German and English from the beginning, I had no problem. TB: And then when you left Germany, you arrived in France? KL: Yes. I arrived with my father, who had an office in France. So, all these was not that dramatic, you know. TB: Yeah, I didn’t see you arrive at Gare du Nord with just one suitcase. KL: Yes, I arrived at Gare du Nord. TB: I’m sure, but it probably was not with one suitcase and not on your own. KL: No, no, no. I mean, in those days you would have been scared of nothing because nothing was dangerous. It’s not like today. Today, arriving at overseas, I’m not sure I would like it the same way. And France I thought, you know, it was quite dirty. It was before the law of Mauroy to clean the city. But I said, “It’s old, but that is France, and that is what you want. So, shut up and wait.” Because it was really not very clean. TB: This sense of Europeanness — and before we started you were mentioning a female European leader whom we don’t need to talk about now. But do you think the Europe project is working? And that there is a future, and I think about a cultural and design future, which is also the engine that you said at the very beginning. Yeah, you sort of look around the French and their focus and what they were good at. Is there that cultural understanding? Is there that understanding of design process? KL: But, you know there is all of that. But when I arrived, I didn’t know what I could do. I saw I was there for two years, and finished school in Germany later. I won this contest and it changed the world for me. So, I couldn’t have known that before. My life came as a surprise to myself. I didn’t even know you could make a living in fashion. KL: You know in those days, it was not the chicest thing in the world. Designers are not stars like today. KL: I was still what the French called, “fournisseur“. TB: What comes first? And I am going to use the ‘B’-word for ‘Brand’. You have Chanel and you have many other maisons. KL: Even if I do — sometimes collaboration but I think that’s something that is very right, very modern, and very stimulating. Because I like to know what is going on in other places. KL: Maybe I have to make it go back to her. Because it was quite far away. TB: And when you look at other companies that bring on a creative direction? TB: That’s okay. But if you look at other companies, how they bring on a creative director, and suddenly, the code changes completely, everything changes, the shop designs change. KL: Yes, I like change. Yes. No, no, no. Tradition may be okay, but you have to be careful not to become a bore. KL: And when designers start to do retrospective and talk about their past and look at their old dresses, it’s very dangerous. It’s the beginning of the end. There is another line I love, an old Jewish line in Germany called, “No credit on the past.” I repeat that to myself every morning. TB: Have you told Choupette this line as well? 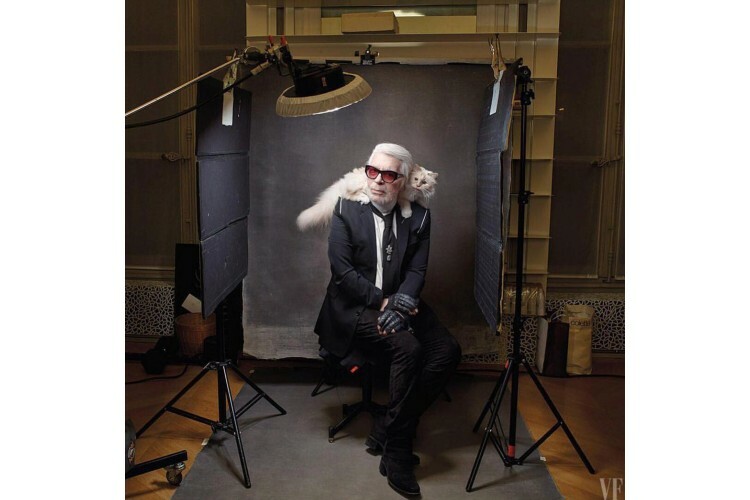 An image of Karl Lagerfeld and his Birman cat, Choupette, in a Vanity Fair shoot, on @choupettesdiary, the cat’s fan page. KL: She’s not interested. She’s only interested in her beauty. KL: Yes, yes. And to seduce other people. TB: Okay. But there must be sort of an intellectual rigour or not, not interested? KL: It would sound great if I say yes, but I think it’s another level. KL: Oh, you can come downstairs and see her. KL: She travels with me, I don’t travel alone. KL: She loves private jets. TB: [Laughs] What cat wouldn’t? KL: I don’t know so many other cats travelling that way with her own personal maid. Karl Lagerfeld stepping off the Chanel airliner show set located in Los Angeles, where he presented Chanel’s Resort 2008 collection. Image source: Shutterstock. KL: Yes, the country has dogs. It is a very strange story. My great friends, Ingrid Sischy and Sandy Brandt, they had a cat called ‘Cassidy’. And I thought they just did too much. They fussed a lot with this Cassidy. I remember one morning, Cassidy had disappeared and there was a drama. And everything was searched. The house, the attic, the basement, the parks, everything. And then Sandy came back to the bedroom, fell on her armchair and cried. And suddenly out of the little piece of furniture next to the armchair came Cassidy. Then one day, a friend came to my house and said that, “I have a cat that is only a few months old I believe. And for two weeks, can your maid take care of it?” And when he came back to me, I said, “I’m sorry the cat is mine.” I fell in love with her and when Cassidy died because it was seventeen, eighteen years old, they said, “No new cat.” But in the end, they ended up with a new cat called ‘Chloe’ because Cassidy and Chloe — you see? And Choupette is not her name but you know, in most places where they are brought up, they gave names before you sell the cat. And her name was ‘Choupette’. But you talk to her, ‘Choupette’, she’s not answering. She only answers when you say, ‘Chou-pi-nette’. KL: Very strange, I think it is the sound of ‘I’. I mean, it’s grotesque but I can be grotesque and I’m not ashamed to be grotesque. KL: I walked in Paris, even at night to discover I never had the feeling of anything could happen to me. Today, I wouldn’t do it. Not because it is me, if I would be me from then, I wouldn’t do it. Too dangerous, no? TB: Does that hold back the creative spirit as well if I arrived as Viard to come and work for Chanel? If I venture out into a world, does that sort of sense of personal fear? KL: Yeah, but I ignored that completely. Today, you can ask a question, but then the question didn’t exist. Like in a way, it is simple not that I regretted. I am totally at ease in the life of today, but you better don’t compare because, in another way, life was modest. Now, we are spoilt in a different way. How was life before the iPhone? Do you remember? How was life before the iPad? Do you remember? I don’t. KL: The people who can afford it don’t need lessons. They need information. And you can educate new generations, but the generations of the new very rich, in some parts of the world, is not the highest level of taste in our standards. You see what I mean?